Leaving Middleburg, headed West on 50, take a left just past the Red Fox Inn, which should have many bikes in front, onto rt 626 South Halfway Rd. Sign shows The Plains to the left. You reach The Plains and go over railroad tracks, making a right onto 55, John Marshall Hwy. Park here if looking for a stop. Leaving The Plains, turn right onto 710, Rectortown Rd and be alert for another right in about 6 miles onto Atoka Rd. rt. 713. It's not well marked. Travel another 8-10 miles North, meeting rt. 50 again, hanging a right and ending back in front of the inn in about 6 miles. Vineyards and farms with scenic hills on the horizon. Through the farmlands and vineyards of the entry to the Virginia plains, on the horizon are the hills and mountains of the Shenandoah. Speed limits are low, 35-45mph posted, but some nice twists on the way South from Middleburg and straighter shot on the return North. There is nothing stopping you between Middleburg and The Plains, and the roads are in very good condition. Speed is moderate and there is occasion for some farm material or gravel to find its way onto the road. Generally very good condition and some good fun, with the limited speed (posted) keeping it from being very challenging. If you're looking for a stop, The Plains has restaurants and shops, which I didn't try, other small general stores along the route. on September 23, 2012 0 out of 0 members found this review useful. Fun short run with the potential of adding on lots of side rides. Ran this route many times and did lots of exploring. Most of the roads are in good shape however there are some pot holes and stray gravel that you need to keep an eye out for on the east west legs. The Plains is a "very" small town but a few places to stop to eat and fuel. 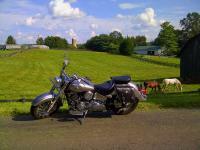 Great place for a newbie to ride and see beautiful country and farmlands. on August 4, 2010 0 out of 0 members found this review useful. it was a good ride. the view is good, not the best but it def is pretty. the small town look makes it feel very special. good ride to get away. on January 16, 2010 0 out of 0 members found this review useful. Good ride - if you miss the entrance to 713 on the right, keep going straight, until you hit a t-intersection at Delaplane Road. Take a right, and head up to 50. It is a nice picturesque scene, with an unmarked road for about 4 miles. on October 29, 2009 0 out of 0 members found this review useful. Very good ride for a newbee (I am) to get used to curves, some blind. The area is very picturesque.